Click here to sign in and manage your site. You will need your password and the e-mail address on your account. To add to, edit or remove text, hover your mouse cursor over the area you want to change. This will make the Page Content menu appear, where you will click Edit to make your changes. You can also double click the area you want to edit and it will open and let you make your changes. Once you're satisfied with your changes, click the Save button near the top left corner of the window. Your domain name account is with GoDaddy. As long as you have a credit card on file it will renew automatically. To check this or any other domain name details, sign in to GoDaddy. You will need to know your user name (or customer number) and password. Go here to add a new event (you must be signed in for this link to work properly). Do not add events directly to the home page. 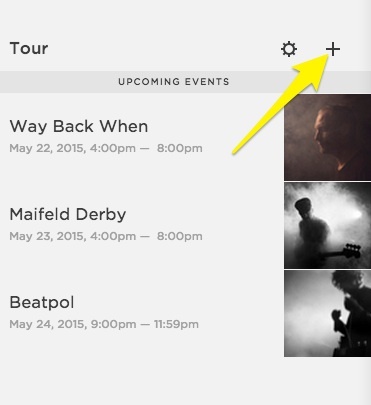 Adding them to this special event calendar area will automatically put them on the home page, in the proper order. To see step-by-step directions for adding events, click here. Your plan includes support from very helpful people who know Squarespace inside and out. When you send them a message asking for help, they will get back to you pretty quickly — even on weekends. To get in touch with Customer Care, start here.